The CIS released the latest National ranking today, and the V-Reds maintained their #1 ranking for the 7th media poll in a row this season and the 17th in a row overall. The V-Reds received 14 of 17 possible first place votes with the McGill Redmen (12-1-2) receiving two first place votes and Lakehead (13-3-0) receiving the final first place vote. Other teams receiving votes: Calgary (8), UPEI (5), Waterloo (3), Ottawa (3), Saint Mary’s (1). This morning the V-Reds announced that former Kelowna Rockets sniper Geordie Wudrick will be joining the V-Reds after Christmas. At 6'4, 214 lbs Wudrick brings more size to the UNB lineup. Let's also hope he brings the same scoring touch that saw him register 43 goals in 71 games last season in the WHL. Wudrick had been playing pro in Germany this fall with the Rosenheim Star Bulls in Germany where he put up 3 goals and 6 assists in 14 games. He has already played a game against CIS opponents, back in September he scored a goal and added an assist in an exhibition game against the CW's 2nd place Manitoba Bisons. In a game that will be rehashed for some time, UNB found themselves down 3-0 after two periods against the STU Tommies, only to score FOUR short-handed goals and an even strength one to win 5-3. The LBR was packed with fans from both teams, and both sets of fans saw STU score three goals on seven shots over two periods. The third period is one that STU would love to forget. Jonathon Harty had a pair of short handed goals, Tyler Carroll had a short handed goal, Dion Campbell had the game winner (Even strength), and then Luke Gallant scored on the empty net short handed as the STU fans saw their team implode in the third period. Final shots were 44-17 for UNB. Has anyone ever heard of FOUR short-handed goals in one period in CIS hockey? Or any hockey for that matter. These two teams are at it again next weekend for the last regular season game of the year. Week 5 is in the history books. Drummer continues to mock the rest of pack with a massive 149 pts, but this is still anyone's game. This week's top performer was Adam Antium with a scorching hot 25 point week. 174th Battle of the Hill goes tonight! Tonight, the CIS #1 ranked UNB V-Reds (9-2-1) travel down the hill to face the AUS #7 STU Tommies (3-8-1) at 7pm at the Lady Beaverbrook Rink in the 174th Battle of the Hill. - UNB is currently on a 27 game winning streak over STU. - UNB is currently on a 10 game winning streak over STU at the LBR. 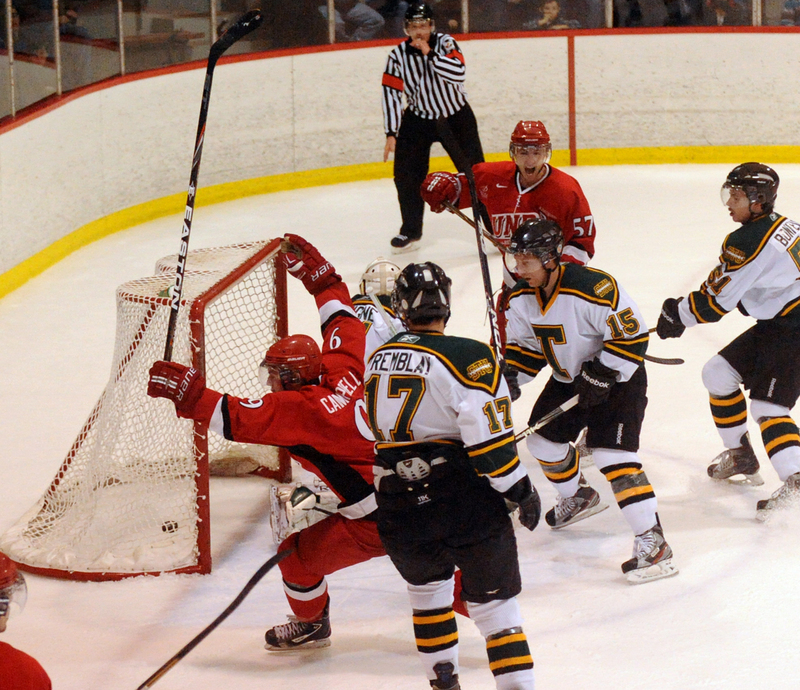 - The last time STU beat UNB in a regular season game was Oct. 20, 2006 at the York Arena. - In last season's four regular season meetings, UNB outscored STU 21-3 and outshot them by an average margin of 44-20. None of these numbers mean anything on game day. The V-Reds are sitting on top of the AUS and CIS right now, but are only (2-2-1)in their last five games. The V-reds are coming off a hard fought 2-1 victory over the CIS #3 ranked UdeM Aigles Bleues (9-3-0) and will be looking to maintain that momentum at they face the Tommies. The V-Reds are led in points by Kyle Bailey (9G 9A) and Luke Gallant (2G 12A). The Tommies are a team rebuilding after last year’s last place finish. The Tommies have already tallied as many wins this season as last year, and have lost by only one goal 4 times this regular season. The Tommies are coming off of a 6-3 loss to the UPEI Panthers (7-5-0), and will look to defeat the V-Reds to get back on the winning track. The Tommies are led in points by Randy Cameron (8G 4A) and Felix Poulin (2G 10A). Come down to the LBR and cheer on your UNB V-Reds as they look to win the Battle of the Hill! If for some reason you cannot make it to the game, you can watch the webcast or get alerts on all the action by following UNBHockey on Twitter. The CIS released the latest National ranking today, and the V-Reds maintained their #1 ranking for the 6th media poll in a row this season, with 12 of 17 possible first place votes. The McGill Redmen (10-2-1) received the other five first place votes. Also representing the AUS were UdeM (9-3-0) who moved up to third from fifth, and Acadia (8-3-1) who moved up to sixth from seventh. Other teams receiving votes: UQTR (10), Nipissing (9), UPEI (7), Carleton (3), Saint Mary’s (2). The CIS#1 ranked V-Reds looked more like themselves today, earning a 2-1 victory over the CIS #5 UdeM Aigles Bleues. The first period saw no scoring, with the shots on goal being 11-6 for UNB. The V-Reds controlled the majority of the play in the second, but it was the Aigles Bleues who scored first, at the 3:42 mark. The second period ended with the shots 29-13 in favor of UNB. The V-Reds finally anwered back at the 9:31 mark of the third period as Kyle Bailey took a great feed from Nesbitt to tie the game. At 12:32, Nesbitt would tally himself to give the V-Reds the lead and the victory. The final shots on goal were 46-16 for the V-Reds. With this win, the V-Reds once again move into first place in the AUS, with a one point lead over UdeM and a two point lead over Acadia. The V-Reds are in action next Friday as they travel down the hill to play the STU Tommies on Friday night at 7pm. For the second time in less than two weeks, the UPEI Panthers defeated the V-Reds, this time with a 3-2 come from behind win. The V-Reds opened the scoring at the 9:02 mark of the first period when Matt Fillier took a feed from Chris Culligan for a short handed goal. The V-Reds scored again at the 10 second mark of the second period, this time it was Kyle Bailey with a power play goal. Then the Panthers woke up. At the 16:42 mark, Chris Dasousa took a feed from Matt Carter and beat Lacosta to make it 2-1. 30 seconds later the Panthers struck again, this time it was Jared Gomes, and the score was suddenly tied. The Panthers would strike again at the 5:17 mark with a goal from Devin Praught. The remainder of the third period saw the V-Reds try to tie it back up, but the Panthers were able to turn them back, with Mavric Parks making several key saves. The Panthers tested LaCosta several times in the third and outshot the V-Reds 14-7 in the final frame, and 35-30 in the game. With that loss, UdeM moves one point ahead of UNB in the AUS, these two teams will meet tomorrow afternoon at 2pm. Come on out and cheer on the V-Reds as they try to get back on track. This weekend, the CIS #1 ranked V-Reds (8-1-1) have a split schedule, travelling to PEI tonight to take on the UPEI Panthers (5-5-0) and then at home for a Sunday afternoon game hosting the UdeM Aigles Bleues (8-2-0). The V-Reds are coming off of their second loss of the season, a 6-5 shootout loss to the CIS #7 ranked Acadia Axemen (6-3-1) and will look to return to their winning ways. The V-Reds are led in scoring by Kyle Bailey (7G 9A) and Luke Gallant (2G 12A). Tonight, the V-Reds visit the AUS #5 ranked Panthers at the MacLauchlan Arena at 7pm. The Panthers are coming off of a 6-3 win over the DAL Tigers (2-9-0) and will look to make it two in a row against the V-Reds. The last time UNB played UPEI was Nov. 5th at the AUC, UPEI won that game 5-4. UNB is 8-2-0 against UPEI in their last ten meetings. The Panthers are led in scoring by Jordan Knox (7G 9A) and Matt Carter (7G 8A). Sunday afternoon, the V-Reds host the CIS #5 ranked Aigles Bleues for a 2pm game at the AUC. The Aigles Bleues are only one point back of the V-Reds, making this “the game of the week” in the CIS according to the latest National rankings. UdeM is on a three game winning streak, their last loss was to the V-Reds on Nov. 4th, when they fell 6-3 at the J.-Louis-Levesque Arena. The V-Reds have an 11 game regular season winning streak going against the Aigles Bleues. UdeM is led in scoring by Marc-Andre Cote (8G 7A) and Dean Ouellet (3G 12A). Tonight's game can be seen as a webcast, and if you cannot make it to the AUC on Sunday, that game will also be available as a webcast. Of course, you can always follow UNBHockey on Twitter. Week 4 is behind us and the race for 1st place is as tight as ever with a just a good weekend separating a dozen or so contenders. Drummer held on to the lead with the slimmest of margins with 126 pts. This week's top performer was Freddyfoyle with 30 pts. The V-Reds remain ranked #1 in the fifth media poll of the season. Acadia moved up from #10 to #7 with their Shoot Out victory over UNB, while UdeM remains #5. The article can be read here. * Saskatchewan edged Western for third place based on number of higher-placed votes. Other teams receiving votes: Carleton (14), Calgary (8), Saint Mary’s (6), Windsor (2). The V-Reds and Axemen battled back and forth all evening, playing 70 full minutes before turning things over to a shoot-out. In the end the Acadia Axemen pulled off the win. Scoring for UNB were Luke Gallant, Jon Harty, Thomas Nesbitt, Nick MacNeil, and Bretton Stamler. Shots on goal were pretty even, 31 for UNB, 30 for Acadia. Dan Lacosta started in goal, but left after the 1st period with the score 2-1 Acadia. Matt Davis took over and played the remainder of the game. The loss leaves the V-Reds with 3 of a possible 4 points on this road trip to Nova Scotia. Perhaps some small consolation to V-Reds fans is the reminder that the team went 0-2 last season, being outscored 9-5, including a tough 6-3 lost to Dal last November 27. UNB remains in 1st place in the AUS with 17 points, 1 point ahead of U de M.
This weekend, the CIS #1 ranked V-Reds (7-1-0) are on the road, travelling to Halifax tonight to take on the Dalhousie Tigers (2-7-0), and then on to Wolfville on Saturday night to do battle with the CIS #10 ranked Acadia Axemen (4-3-1). The V-Reds were once again voted the top team in the country in this week’s media poll, receiving 15 of 17 possible first place votes. The V-Reds have now been ranked #1 for the last 15 national polls, dating back to January 11, 2011 and have topped 47 of the last 69 polls (.681) since 2006-07. Tonight, the V-Reds arrive in Halifax to play the Tigers at 7pm. The V-Reds will be looking to get back on the winning track after suffering their first defeat of the regular season, a 5-4 loss to UPEI (4-4-0) last Saturday night. The last meeting between these two teams saw the V-Reds dismantle the Tigers, the final score being 10-1. UNB is led in scoring by Kyle Bailey (6G 5A) and Luke Gallant (1G 10A). The Tigers are not off to a great start this season, and will both be looking to avenge the lopsided defeat that the V-Reds handed them last game, and to start winning games after losing the last six in a row. The Tigers are led in scoring by Benjamin Breault (5G 5A) and David MacDonald (1G 5A). Saturday night Axemen will host for the V-Reds at the Acadia arena at 7pm. The Axemen still boast the best power play in the AUS (27.1%), along with a defense (23.38 shots allowed / game) that is second only to UNB (19 shots allowed / game). The Axemen are led in scoring by Andrew Clark (6G 7A) and Christopher Owens (3G 8A). Both games are available as webcasts; the Tigers webcast, and the Axemen webcast. You can also follow UNBHockey on Twitter. Week 3 results are up, and Drummer continues to cling to top spot in the AUS Pool. This year might be the closest ever as just a few points separate the leader from the pack. This week's top performers were PK and Gamer with an impressive 25 pts. The top 10 standings are listed below, full results are available on the AUS Pool Page. 2011 National Champs get their rings! Head on over to the Varsity Reds website to read about the championship rings that the V-Reds received for their amazing season last year. The CIS released the fourth Men's Hockey Top 10 rankings of the season today. The CIS defending National champion UNB V-Reds (7-1-0) are once again ranked #1 in the Nation, receiving 15 of the 17 possible first place votes. McGill (8-0-2) received the other two first place votes. Also representing the AUS are #5 UdeM (6-2-0), who have the second best record in in the AUS, and #10 Acadia (4-3-1). Other teams receiving votes: Nipissing (26), UPEI (17), Carleton (8). The V-Reds had an off-night and ended up on the wrong side of a 5-4 game against the UPEI Panthers. Scoring for UNB were Jordan Clendenning, Josh Kidd, Jon Harty, and Luke Gallant. UNB thought they had another goal, but the ref blew the whistle before the puck crossed the line. Matt Davis played the game in goal and made a few good saves with the game close to give his team a chance, but it just wasn't meant to be on this night . Final shots were 43-27 UNB. The loss leaves UNB in 1st place with a 7-1 record. UNB plays Dalhousie in Halifax next Friday before visiting Acadia on Saturday. Lead by a balanced offensive attack, the V-Reds continued their winning ways with a strong effort against the 2nd place Aigles Bleus. Scoring for UNB were Dion Campbell, Bretton Stamler, Kyle Bailey with two, Chris Culligan, and Jeff Lee. UNB continues to thrive on adversity. With goalies Travis Fullerton and Dan Lacosta both on the injured list, Matt Davis took the win in goal in his first game for the V-Reds, making 25 saves. In addition to the debut of Matt Davis in red n' black, Chad Denny played his first game and threw his weight around. Nick MacNeil made his return to the V-Reds lineup. The V-Reds return home and regroup Saturday night vs. the UPEI Panthers. To get a perspective on how the "other guys" look at UNB as a challenge, check out the article in the Times and Transcript today about how UdeM sees the challenge that the V-Reds bring to their rink. What do you guys think will be the outcome of tonight's game? Moncton is a short drive, if you can make it down for the game, come join us and cheer on your CIS #1 ranked V-Reds! UNB in action against UdeM and UPEI this weekend! This weekend, the CIS #1 ranked V-Reds (6-0-0) are on the road on Friday night, visiting the CIS #6 ranked UdeM Aigles Bleus (5-1-0), and Saturday night they are hosting the AUS #3 ranked UPEI Panthers (3-3-0). Tonight, the V-Reds travel to the J.-Louis-Levesque Arena for a 7pm game against the Aigles Bleus. The V-Reds were once again voted the top team in the CIS this week, with all 17 voters giving them the #1 spot. This makes 14 National polls in a row that the V-Reds find themselves sitting on top of the National rankings. The V-Reds are currently led in scoring by Kyle Bailey, Tyler Carroll, and Jordan Clendenning all with seven points (4G 3A). The CIS #6 ranked Aigles Bleus are riding a five game winning streak, and are currently only two points back of the V-Reds. Last weekend, the Aigles Bleus were on the road in NS, defeating StFX (2-5-0) 4-2 on Friday night, and then SMU (3-4-0) 3-1 on Saturday night. UdeM is led in scoring by Christian Gaudet (4G 8A) Marc-Andre Cote (5G 5A) and Dean Ouellet (4G 3A). Tomorrow night, the V-Reds host the Panthers at 7pm at the AUC. The Panthers are on a two game winning streak, having defeated the Dalhousie Tigers (2-4-0) 6-2 last Friday night, and the Acadia Axemen (3-3-0) 5-3 last Saturday night at home. UPEI is led in scoring by Matt Carter (4G 4A) and Jordan Knox (4G 3A). UNB currently has a 10 game regular season winning streak going against UdeM, and a three game winning streak against UPEI. The games are available as a webcast and as always, you can follow UNBHockey on Twitter. There is a great article in the Brunswickan this week where Kyle Bailey and Jordan Clendenning discuss UNB's winning ways, the PP situation, and the need to continuely improve their performance through strong practices. Check it out here. The CIS released the third Men's Hockey Top 10 Rankings of the season today. The CIS defending National champion UNB V-Reds (6-0-0) once again earned all the first place votes from the panel of media from across the country. Also representing the AUS are #6 UdeM, who have the second best record in in the AUS, and #9 Acadia, who dropped from #3 last week. Other teams receiving votes: UQTR (20), Alberta (13), UPEI (9), Queen's (5), Waterloo (2), Brock (1), Ryerson (1), StFX (1). Week 2 results are up and Drummer continues to set the pace with an impressive 80 pts, but several contestants are just a good weekend away from overtaking him. This week's top performer was Dungarvon with a wicked 37 points. You might notice a few extra teams this week. We had a few entries lost in our junk folder but we think we've managed to add all the submissions. If you don't see your team here, just let us know. The top 10 standings are listed below, but check out the entire standings at the AUS Pool Page. As always, if you see an error, just drop us a line and we'll look into it for you. There's been some big surprises early in this AUS season, and some unfamiliar names at the top of the scoring charts. It should be an exciting year. The V-Reds thoroughly handled the DAL Tigers tonight, scoring 10 times before the game had ended. UNB came out hard, and for the first 7:22 of the game, UNB looked to be pretty much dominating the Tigers, then J. Villeneuve-Gagne capitalized on a UNB turnover to score on the first DAL shot of the game. That quieted the crowd almost completely. However that was the end of the good news for the Tigers, as Jordan Clendenning set up Chris Culligan twice before the period was out, sending the teams to the dressing room with a score of 2-1 after one period of play. UNB came out hard in the second, forcing the Tigers to take three penalties, two of which Kyle Bailey scored on. Also scoring for UNB in the second were Jeff Lee, Jordan Clendenning, and Taylor MacDougall. The third period was not any better for the Tigers, as Joran Clendenning scored again, Antoine Houde-Caron picked up a short handed goal, and Luke Lynes finished off the scoring to make it 10-1. The final shots were 36-16 for UNB, the three stars of the game were Jordan Clendenning (2G 3A), Chris Culligan (2G 2A), and Luke Gallant (2). First, our apologies for being late getting these up. There were some technical difficulties on our end that should be resolved with the purchase of our new Tandy 2000, so faster results this week! Looks like a pretty tight race out of the gates, with Drummer (someone check those numbers) taking the lead with an impressive 52 pts, followed by a mob of others. Lots of hockey left, so everyone is still very much in running. As always, feel free to double check our results. If you think we've made a mistake, we probably have, so kindly send us an email and we'll look into it. The top 10 are listed below, and the complete standings can be viewed at the AUS Pool page. Finally, big thanks to Drummer and www.vredshockey.com for hosting the pool page again this year. Tonight, the CIS #1 ranked V-Reds shut the CIS #3 ranked Acadia Axemen out 3-0 to improve to 5-0-0 on the season. UNB set the tone 44 seconds in to the first as Fillier put the puck behind the Axemen goalie. Bailey and Harty assisted on the goal. That would be the end of the scoring for the first period, with UNB outshooting the Axemen 13-4. Clendenning made it 2-0 in the second, scoring on a nice feed from Culligan who was back in the lineup. Fullerton made several big saves in the second, as the Axemen outshot UNB 11-6 in the period. The third period saw the Axemen continue to push, and with 2 minutes remaining they pulled their goalie, but Carroll would make them regret it as he scored on the empty net to make it 3-0. That was the first shutout of the AUS regular season, the final shots were 26-18 for UNB. The V-Reds are back tomorrow night to take on the DAL Tigers who fell 6-2 to UPEI tonight. This weekend the CIS #1 ranked UNB V-Reds (4-0-0) are at home to take on the CIS #3 ranked Acadia Axemen (3-1-0) and the AUS #4 ranked Dalhousie Tigers (2-2-0). The V-Reds were once again voted the top team in the country, this time receiving all 17 of the top place votes in the weekly media poll. The V-Reds have battled through the injury of many key players, and are still undefeated this season, the only team in the country to have not had a loss thus far. The V-Reds are on a 17 game regular season winning streak at home dating back to Feb. 12th of 2010. UNB is led in scoring by Dion Campbell (3G 3A) and Tyler Carroll (3G 2A). Tonight will be a battle of the stingiest defense and the most potent offence in the AUS as the V-Reds, who have allowed the fewest goals thus far this season, host the Axemen who have been making waves in the AUS this season. The Axemen currently have the highest shots per game, goals per game, Power Play goals, and Power Play percent in the AUS. The Axemen are led in scoring by Andrew Clark (4G 6A) and Joe Gaynor (4G 2A). Saturday night, the V-Reds host the Tigers at 7pm at the AUC. The Tigers have struggled a bit this season, losing two rather lopsided games to UdeM (3-1-0), while defeating The STU Tommies (0-4-0) twice in fairly close games. The Tigers are led in scoring by Benjamin Breault (4G 1A) and P.-Alexandre Vandall 1G 3A). Both games can be viewed on Rogers TV, viewed as a webcast, listened to on CHSR 97.9, and as always, you can follow UNBHockey on Twitter. The CIS released the second Men's Hockey Top 10 Rankings for the new season today. The CIS defending National champion UNB V-Reds (4-0-0) rest firmly on top of the competition, having received 170 points in the voting system. UNB received all 17 of the possible first place votes. The Manitoba Bisons (4-1-1) and Acadia Axemen (3-1-0) each move up one spot in the new poll to No. 2 and No. 3, respectively. Also representing the AUS was StFX (2-2-0), dropping one spot to #8. Other teams receiving votes: Moncton (21), Nipissing (12), Lakehead (12), Alberta (9), Queen’s (3). Saturday night at the venerable Halifax Forum the University of New Brunswick Varsity Reds had an early lead and sustained third period pressure from the Saint Mary's Huskies to hang on for a 4-2 win and remain the only undefeated team in AUS men's hockey. Player of the game Dion Campbell scored UNB's first goal and assisted on all three of the other V-Reds goals. The early play of the first period was all in the Huskies zone, and at 2:43 Dion Campbell (Melville, SK) came flying down the right side of the ice and his shot beat Neil Conway (Painesville, OH) on the far side. Later at 9:47 rookie Stefan Salituro (Toronto, ON) picked up his second assist of the game when he and fellow rookie Antoine Houde-Caron (Trois-Rivièrs, QC) broke into the Huskies zone on a two-on-one and Houde-Caron scored. The shot margin at the time of the goal was 10-3 in favour of UNB. The second period was better for the Huskies, as they appeared to gain momentum coming out off the power play at 7:22 with Kyle Bailey (Ponoka, AB) called for cross-checking. After several strong Huskies shifts Joshua Domingues (Markham, ON) had a glorious scoring chance on Travis Fullerton (Riverview, NB). UNB coach called a timeout to talk to his team. Despite the strong Saint Mary's pressure it was UNB getting a goal late in the period at 19:20 when the puck was turned over in the Huskies zone and V-Reds captain Bailey sniped a shot from the circle that beat Conway on the short side. UNB started the third period on a power play with SMU's Justin Wallingford (Hamilton, ON) in the box. At 1:43 Marc-Antoine Desnoyer (St.-Hippolyte, QC) ripped a point shot that went through a crowd and top shelf. That goal broke a goose egg for the V-Reds – up to then they had not scored a power play goal in the season with 16 man-advantage opportunities in the previous three games. Coincidentally the Huskies penalty kill had been perfect up until the Desnoyers goal, killing off 23 straight penalties. After the goal Saint Mary's head coach Trevor Steiburg elected to put rookie Anthony Peters (Blyth, ON) in nets. Seconds later Wallingford was back in the box for kneeing, but it was Huskies rookie penalty killer Stephen Johnston (Guelph, ON) who created a breakaway from centre ice and beat Fullerton glove side at 2:20. Shortly after the penalty was over Chris MacKinnon (Richmond Hill, ON) led a Huskies rush into the UNB zone and beat Fullerton 4:14 to make it 4-2. The rest of the period was uneventual, other than a power play apiece. UNB outshot Saint Mary's in every period and 28-16 in the game. UNB is now 4-0-0 in the young season and all alone in first place in the AUS standings. Moncton and Acadia are tied for second place with identical 3-1-0 records. Next weekend the Varsity Reds are back home to host Acadia and Dalhousie. Game Notes: Injured UNB forwards Chris Culligan and Nick MacNeil and defenceman Josh Kidd did not dress for the game. SMU was missing injured d-men Kyle Wharton and Tyler Cuthbert. The V-Reds found themselves down 3-1 at the end of the first period, but rallied to score 6 goals the rest of the way to secure a 7-6 victory at STFX. Scoring for UNB were Luke Lynes, Tyler Carroll, Dion Campbell, Kyle Bailey, Thomas Nesbitt, Antoine Houde-Caron and Jonathan Harty. Final shots were 30-22 in favour of UNB. Bailey lead the team 3 points, while Bretton Stamler (2 assists), Carroll, Harty and Nesbitt each had two points. Travis Fullerton went the distance in goal for the V-Reds. The win puts UNB at 3-0 to start the season. This weekend, The CIS #1 ranked UNB V-Reds travel to Nova Scotia to take on the CIS #7 ranked StFX X-Men and the SMU Huskies on Friday and Saturday night. 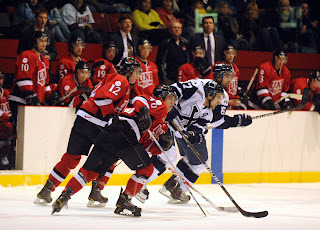 Tonight, the V-Reds (2-0-0) travel to Antigonish to face the CIS #7 X-Men (1-1-0) at the Keating Millennium Centre at 7pm. It was only last Saturday night that these two teams did battle at the AUC in Fredericton, with the V-Reds coming out on top with a score of 3-1 and outshooting the X-Men 32-20. For the 12th National poll in a row (11 last season and one this season) The V-Reds were voted as the #1 team in the Nation by a committee of media members from across Canada. The V-Reds received 15 of 17 possible first place votes, and have topped 43 of the last 65 polls (.662) since 2006-07. The V-Reds are currently being led in scoring by a pair of rookies, Tyler Carrroll (2G 1A) and Taylor MacDougall (1G 2A). The X-Men may have lost their first game of the regular season to the V-Reds, but came back the next night and soundly defeated the CIS #11 ranked UPEI Panthers (1-1-0) by a score of 5-2. The X-Men are led in scoring by last year’s CIS Rookie of the Year Jason Bast (2G) and Josh Day (1G 1A). Saturday night, the V-Reds travel to Halifax to take on the SMU Huskies (0-2-0) at 7pm at the Halifax Forum. The SMU Huskies have not had a great start to the 2011-12 regular season, losing both of their opening contests last weekend. Friday night they were defeated 5-2 by the UPEI Panthers, and then fell 3-1 the V-Reds on Saturday night. The Huskies are led in scoring by Parker Deighan, Michael Stickland, and Matt Tipoff, each with one goal. The X-Men game can be seen as a webcast here, while the SMU webcast can be found here, and as always, you can follow UNBHockey on Twitter. You've all had the benefit of one weekend of AUS action, so now's the time to sharpen your pencil and pick the best team possible in the 2011-12 AUS Hockey Pool. If you haven't already, click here to find the AUS Pool page and download the box sheet. Follow the instructions and return it to us. Remember, you have until 5PM this Thursday to submit. After that, you can still submit your pics, but you'll be penalized 2 pts per day. 1st place: 2 tickets to the UNB home game of your choice during the AUS playoffs. The CIS released the first Men's Hockey Top 10 Rankings for the new season today. The CIS defending National champion UNB V-Reds (2-0) rest firmly on top of the competition, having received 165 points in the voting system. UNB received 15 of the possible 17 first place votes. Rounding out the top three were McGill (4-0-0) and Manitoba (4-0-0). Also representing the AUS were Acadia (#4) and StFX (#7). - UNB was ranked No. 1 in the last 11 national polls of 2010-11 and has topped 43 of the last 65 polls (.662) since 2006-07. - This is the lowest ranking for Alberta since the Golden Bears were eighth on Oct. 28, 1996 (second poll of 1996-97). The Bears (2-1-1), had not been ranked lower than fourth in the country in the last 14 seasons (1997-98 to 2010-11). Other teams receiving votes: UPEI (12), Queen’s (9), UBC (9), UQTR (7), Brock (1), Lakehead (1). The V-Reds made it a four point weekend as they defeated the SMU Huskies 3-1 tonight. The first period saw no scoring, with the V-Reds controlling the majority of the play and the final shots for the period 12-4 in favor of UNB. The second period saw the V-Reds come out flying, and they were rewarded at the 4:00 minute mark when Tyler Carroll scored. Matt Fillier made it 2-0 at the 5:03 mark with a beautiful deke that completely fooled SMUs goalie. At the 7:04 mark it was Taylor MacDougall, scoring his first as a V-Red, to make it 3-0. Shots were 28-11 after two periods. The V-Reds looked a little flat footed in the third, and were caught on a bad pass give away which Tipoff capitalized on at 10:21 to make it 3-1. That was the end of the scoring, SMU pulled their goalie with 1:17 left, but could not muster a good scoring opportunity. The final shots were 34-21 in favor of UNB. UNB is on the ice again next weekend when they travel down to Nova Scotia to play StFX and SMU. FREDERICTON – Friday night at the Aikten University Centre the Atlantic University Sport men's hockey season opened first with a championship banner raising and then a tightly played match between last year's two AUS championship finalists, the University of New Brunswick Varsity Reds and the StFX X-Men, all in front of a large appreciative crowd of 3345. The V-Reds came out on top 3-1, for their 23rd consecutive home opening win. After the emotional opening ceremonies surrounding the University Cup and UNB's fourth CIS men's hockey banner, the V-Reds came out flying and dominated the early play, outshooting the X-Men 8-1 by the middle of the first period. This was helped by two early power plays. The Varsity Reds nullified their third power play opportunity at 17:06 when Nick MacNeil (Creignish, NS) was too physical on the forecheck and was called for roughing. However the resulting 4-on-4 play worked out nicely for UNB when StFX netminder Joey Perricone (San Juan Capistrano, CA) first made a lunging glove save on a Tyler Carroll (Strathroy, ON) shot but didn't have complete control of the puck when d-man Jonathan Harty (Oromocto, NB) crashed into the scrum in front of the net and Jordan Clendenning (Fredericton, NB) was then able to push the loose puck under Perricone at 17:46. That was pretty much all of the excitement in the close-checking first period that did see the X-Men generate more scoring chances later in the period. Shots were 10-7 for UNB. In the second period it was the Varsity Reds that generated a parade to the penalty box. StFX took advantage at 8:57, when defenceman Josh Day (St. John's, NL) threaded a pass through the slot to Jason Bast (Regina, SK) at the bottom of the left circle near the goal line and Bast wired a shot over the shoulder of Travis Fullerton (Riverview, NB) and just under the crossbar. A few minutes later rookie Thomas Nesbitt (Ottawa, ON) had a chance to restore UNB's lead on a near breakaway, but instead he was called for goaltender interference when he lost control of the puck and took Perricone's skates out from under him as he slid into the net. A better UNB breakaway scoring opportunity came at 17:00, when penalty killing Dion Campbell (Melville, SK) was all alone from the blue line in, but he couldn't get Perriocone to bite on his deke attempt. UNB edged StFX 9-8 on shots in the middle period. The first half of the third period was a typical UNB-StFX period with the X-Men allowing the V-Reds to carry the puck into the neutral zone where they would meet them and try to create turnover opportunities. That changed at 11:16. UNB rookie Taylor MacDougall (New Maryland, NB) came down the left wing on a line change and fired a puck from the blue line that was just off the net but bounced off the rear boards back to the crease area. Campbell swooped into the zone through traffic and won the race for the loose puck and then put it past Perricone. StFX responded with a couple of good push-back shifts and forced UNB d-man Ben Wright (Foremost, AB) to take a crosschecking penalty at 13:42. However the X-Men weren't able to generate any real scoring chances with the man advantage, and then for the rest of the period UNB threw up a suffocating wall in the neural zone and took away time and space for a comeback. StFX coach Brad Peddle called a timeout at 19:02 to plot strategy, but the X-Men were burned ten seconds later when Carroll got the puck at the blue line and snapped a shot into the net that Perricone was still skating away from. UNB outshot StFX 12-7 in the final period and 31-22 in the 3-1 victory. The V-Reds were 0-for-6 on the power play while the X-Men were 1-for-8. Game Notes: UNB's Josh Kidd and Chris Culligan did not play in the home opener and are “day-to-day” with undisclosed injuries. Rookie Stefan Salituro was also a scratch. Daine Todd continues his rehab from off-season shoulder surgery and skated in the warm-up, but has yet to play a game this season. Tyler Carroll was playing his first game for the V-Reds since being blindsided by Calgary's Walker Wintoneak on September 23rd. It was returning captain Kyle Bailey's first UNB game of the season, since he missed the entire exhibition preseason preparing for and attending Winnipeg's AHL team camp in St. John's, NL. Bailey graduated from UNB in the spring, but elected to return for his last year of eligibility and enrol for graduate studies after not getting a guaranteed contract offer from the IceCaps. The V-Reds raised the CIS banner tonight, then went out and beat the X-Men 3-1 in front of 3,345 fans at the AUC. Scoring for UNB were Clendenning, Campbell, and Carroll with the empty netter. Final Shots were 31-22 for UNB. Scoring for the X-Men was Jason Bast. The V-Reds are back in action tomorrow night when they take on the SMU Huskies at 7pm at the AUC. The Regular season starts, TONIGHT! The V-Reds begin their CIS title defense in grand fashion this weekend, hosting last year’s #2 and #3 teams in the AUS to start the regular season. Tonight the V-Reds host the StFX X-Men at 7pm at the AUC, while Saturday night they host the St. Mary’s Huskies at 7pm, also at the AUC. Overall, the V-Reds went a healthy 5-2-in the preseason, despite some injuries and players away at pro camps. The rookies are fitting into the lineup well, goaltending and defense continue to be strengths, and the team has learned to battle through adversity, playing most of its exhibition schedule with 3 or 4 top 6 forwards and 3 top 6 d-men out of the lineup. The loss of Hunter Tremblay, the team’s all-time scoring leader was a blow, but the captain Kyle Bailey is back in the mix for his fifth year of eligibility. With nine new bodies on the roster, and a core of returning veterans, UNB will once again be looking to battle for the top spot in the AUS. The X-Men, under the guidance of Coach Peddle, finished third in the AUS last year, and earned a spot in the Nationals where they went 1-1 and finished third in the tournament. The X-Men lost eight players at the end of last season, but have added eight new recruits to fill those spots. The X-Men went 4-2 in the preseason this year, including wins over NCAA Division 1 schools Boston University (6-4) and Northeastern University (8-5). The Huskies, under coach Stienburg, finished second in the AUS last year, and were defeated by StFX in the AUS semifinals 3 games to 2. SMU lost Andrew Hotham, Cam Fergus and captain Justin Munden to graduation last year, along with others, but has seven new players on the roster to pick up the slack. SMU went 3-2-1 in the preseason, but will have a short bench this weekend as several players will not make the road trip due to injuries received in the preseason. Both games can be viewed on Rogers TV, or as a webcast, and as always, you can follow UNBHockey on Twitter. We're happy to announce that the third annual UNBHockeyFans.com AUS Hockey Pool is back by popular demand. Think you know AUS hockey? Put your skills to the test against other AUS hockey fans by joining our open-invitation, free AUS Hockey Pool. There's no money at stake, just your hockey pride. Last year, AUS Fan and BruinsFan0877 waged war in the heavens in a fiery spectacle of hockey pool wizardry. Ultimately, AUS Fan was crowned undisputed overlord of AUS hockey. Can he do it again? We will accept participants until 5 PM AST on Thursday, October 20th. After that, you can still submit but will be penalized 2 pts per day. The UNB Varsity Reds have added some big help on the blue line. Chad Denny, a former 49th overall pick in the 2005 NHL entry draft has been attending classes and is waiting to regain eligibility. Deny played 4 years with the Lewiston MAINEiacs before splitting parts of 4 seasons between the ECHL and AHL. Denny is a big body presence at 6'3 and over 220 lbs and will challenge Josh Kidd for hardest shot on the V-Reds team with a cannon clocked at over 100 mph. Because Denny played a few games professionally last fall he must wait until November to gain eligibility for CIS hockey. Click here for more from the Daily Gleaner. The 3-3 tie in UMass Lowell wrapped up the V-Reds pre-season. Overall, the team went a healthy 5-2-1 with a lot of positives coming out of the games. Rookies are fitting into the lineup well, goaltending and defence continue to be strengths, and the team has learned to battle through adversity, playing most of its exhibition schedule with 3 or 4 top 6 forwards and 3 top 6 d-men out of the lineup. The team kicks off its regular season this weekend with games against STFX and SMU before playing the same teams the following weekend in Nova Scotia. We hope you've had time to scout the AUS competition during the pre-season. You'll need it to win the 3rd Annual 2011-12 AUS Hockey Pool...more on that this week. A late third period goal from Dion Campbell helped send the game into overtime where Antoine Houde-Caron netted the game winner in the extra frame. The final result was a hard-fought 2-1 victory over Holy Cross in Worcester, MA. Shots were 33-11 for UNB. Travis Fullerton played the entire game in goal for the V-Reds, who will travel to UMass Lowell tomorrow for their final exhibition game before the regular season starts. The CIS defending champion UNB V-Reds are on the road again this weekend, visiting Holy Cross on Friday night, and UMass Lowell on Saturday night. Friday night, the V-Reds arrive in Worcester to take on the Holy Cross Crusaders at 7pm EST. The Crusaders were recently picked third in a coaches’ poll of the twelve team Atlantic Hockey Association and will look to start their preseason on a high note. This is the first ever meeting of these two teams, and the V-Reds will look to come out strong after two losses the previous weekend. The live game stats can be found here. On Saturday night, the V-Reds visit UMass-Lowell at 7pm EST at the Chelmsford Forum. Recently UMass Lowell was selected to finish ninth in the annual Hockey East Preseason Coaches' Poll. The only other meeting between these two teams was on Oct. 13th, 2008 when the V-Reds fell 5-3 in this same building. Bruce Hallihan brings the scoop in today's Daily Gleaner, and what a scoop it is. UNB captain Kyle Bailey is returning to the V-Reds for his final year after all. Bailey led the V-Reds to their 4th CIS National Championship last spring after putting up 10 goals and 29 points in 28 games in the regular season. Bailey is known for scoring some big goals, including 2 AUS championship winners, and has been a consistent playoff performer. In addition to the offensive boost, Bailey's addition injects veteran leadership, grit, heart, and experience to the UNB forward ranks. Bailey will not be traveling with the team this weekend on the trip to US. The V-Reds found themselves on the wrong side of too many powerplay opportunities, including several 5-on-3 disadvantages, against a speedy Maine team. The result was a 7-3 loss to the Black Bears on Sunday evening. Scoring for UNB were Chris Culligan, Thomas Nesbitt, and Luke Gallant. Shots were slightly in favour of Maine, ending at 26-25. Dan Lacosta completed the game in goal for UNB. The V-Reds are now 4-2 in exhibition play. They'll look to regroup for next weekend's visit to Holy Cross and UMass. An early short-handed goal by UNH set the tone on Saturday night. The UNH Wildcats cruised to a 3-0 win in front of 4800 fans. UNB found themselves with only 4 defenceman for most of the game after Marc-Antoine Desnoyers was ejected for a face mask infraction in a scrum in the 1st period. Final shots were 34-20 for UNH. Travis Fullerton played the entire game and made several big saves to give his team a fighting chance. The team will prepare for its next game vs. UMaine, Sunday at 4pm. The V-Reds continue their pre-season schedule this afternoon vs the University of New Hampshire Wildcats. The last time the two clubs met saw Mike Ouzas backstop UNB to a 4-3 win back on October 12, 2008. UNB is 1-2 all-time vs UNH. And as always, UNBHockey on Twitter will provide updates throughout the game. Game time is 4 PM EST. In today's Daily Gleaner, Jamie Ross writes about the upcoming Gary Brooks Memorial Game vs. the Calgary Dinos in Fredericton Junction on September 24th. It's a great way for both CIS teams to help support a community's minor hockey efforts. For V-Reds fans, it looks as though a tailgate party will be waiting for us with barbecued goodies prior to the game. With limited seating capacity, make sure you pick up your tickets early. The Missouri Mavericks have announced the signing of former V-Reds forwards and fan favourites John-Scott Dickson and Lachlan MacIntosh. MacIntosh just wrapped up his third CIS championship with the V-Reds in March, while Dickson spent last season in the ECHL with Idaho and Gwinnett. With five gold and two silver medals between them, that's a lot of precious metal exporting to Missouri this fall. Best of luck to Lachlan and John-Scott! Today's Daily Gleaner is reporting that former V-Reds defenceman and assistant coach Karl Taylor will be serving as assistant coach for the Chicago Wolves of the AHL. Taylor played for UNB from 1990 to 1995 and was behind during the 1997-98 championship year for former coach Mike Kelly. The article also confirms that the September 24 game vs. Calgary will be held in Fredericton Junction at the Tri-County Complex as the Garry Brooks Memorial Game with some of the proceeds going to benefit Tri-County Minor Hockey. Kudos to both teams for agreeing to play the game in Fredericton Junction to help raise some money for minor hockey. The UNB Varsity Reds have unveiled their non-conference schedule for the upcoming 2011-12 hockey season, and it features top notch competition from both the CIS and NCAA. The defending 2011 CIS National Champions will play their 1st game on the road in Nova Scotia versus Dalhousie on Monday, September 19th to kick off the season. Final location of this neutral site game will be announced later this week. They will then take on CIS Western “Nationals” participant – the University of Calgary Dinosaurs on Sept 23rd and 24th in their annual Fall Classic Challenge. This is the second part of an exchange trip as the Varsity Reds had travelled to Calgary last September to play U of C and Alberta. The next week-end, UNB will play 3 key games in 4 nights as they will host UQTR from Quebec in Woodstock, NB on Thursday, September 29th before heading on the road to play two top rated NCAA Hockey East programs. This includes a 4:00 pm match-up versus University of New Hampshire on Saturday, October 1st followed by a 7:00 pm Sunday evening contest against the University of Maine. UNB and Maine have had a great cross border rivalry for the past several seasons. UNB will then make a second trip to the USA on Friday, Oct 7th when they will play their first ever game versus Holy Cross in Worchester, Mass before ending their fall non conference schedule with a game against University of Mass-Lowell on Saturday, October 8th. UNB is scheduled to have their AUS home opener on Friday October 14th against St Francis Xavier. UNB will host their 7th annual Pete Kelly Classic Challenge as they will host University of Ottawa on December 30th and a special Family New Year’s Eve special at 1:00 pm on Dec 31th at the Aitken Centre. It is also announced that 2 NCAA schools will visit UNB in 2012. This will include the fall of 2012 and as part of the 2012 Pete Kelly Classic. For further info contact the UNB Hockey office at 447-3066. In today's edition of the Daily Gleaner, V-Reds Marketing Director Dave Morell discusses season tickets and University Cup passes. The short and sweet of it is for $250 you get your reserved seat for regular season and Nationals. You also get the opportunity to buy a second seat at Nationals for $125. It also looks like students will get into all regular season sports for free, excluding Mark Jeffrey and playoff games. August 22nd is the big day when season ticket holders get first crack at renewing their passes. You'll have until September 2nd to do so, after that, your seat is fair game to the general public. According to the official Varsity Reds website, fans will be able to renew their season passes and University Cup tickets beginning August 22nd. The window to renew will stay open until September 2nd, at which time all remaining seats will be made available to the general public. More information will be available August 12th. 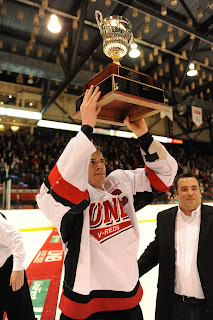 The defending 2011 CIS National Champion UNB Varsity Reds would like to announce that two graduating defenceman – 4th year BBA graduate Luke Gallant – Bedford, NS and 3rd year BBA graduate Jon Harty – Oromocto, NB will be returning to UNB for the upcoming 2011-12 season. They both have been accepted and will pursue their MBA degrees at UNB. Gallant is coming off a sensational National tournament where he was the tournaments leading scorer and garnered MVP recognition. He had struggled throughout the 2010-11 regular season with 2 major injuries and missed the majority of the AUS play-offs with another injury before playing a major role in winning his 2nd CIS National Championship for UNB. Gallant had an outstanding 2009-10 season ( 27GP 6-30-36)where he was named a CIS All Canadian Defenseman and a 1st team AUS All Star. He is also a two time Academic All Canadian. 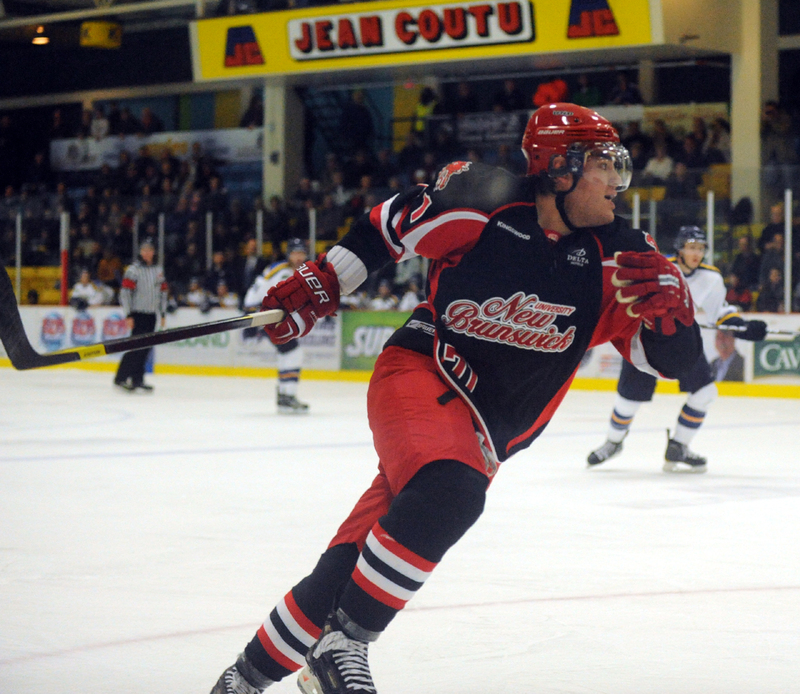 Gallant had played four years in the QMJHL before joining the UNB program. Harty also had a strong 2011 National tournament where he was recognized as a CIS tournament all star for his superb play. It was also his second National Championship in just three years. Harty has been one of UNB’s most improved players and had a real impact on the UNB defence since forgoing his final year of junior eligibility to come to UNB as a twenty year old freshman. He was a stalwart on the UNB defence last year as he was 5-14-19-100pms in 28 games played. Harty finished his degree in just three years and was also a CIS Academic All Canadian. He had played four seasons in WHL and was former captain of the Everett Silvertips. “The upcoming 2011-12 season promises to be the biggest year in the history of our program as we again are proud to host the National Championships – the opportunity to bring both Luke and Jonathon back is a huge boost for our team as they are proven veterans who know what it takes to excel at the crucial moments of a season. They also have a lifetime opportunity to earn a Master’s degree which will have a significant impact on their future once their UNB and pro careers are complete. “were the comments of UNB coach Gardiner Mac Dougall. The Varsity Reds also announced that third year forward Taylor Prochyshen and potential fifth year forward Ryan Seymour have both announced their retirements. Prochyshen was a blue chip prospect from the WHL who suffered a series of concussions in the WHL and at UNB that forced his decision. The speedy winger was injured in Game 4 of the AUS semi-finals and didn’t return to the UNB line up. He had previously missed the 1st half of the 2010-11 season and the back half of his rookie 2009-10 season. The veteran Seymour – a UNB assistant captain was going into his second year of his law degree and decided to focus fully on his studies after winning two National Championships in his UNB career. A three year QMJHL captain, the personable Seymour established a key role at UNB as one of their fittest and hardest working players and one of their top penalty killers. The Varsity Reds will release their upcoming non conference schedule for the season later this week.